Sprial Model of Popular Education. From the Bob Hale Youth College for Social Justice: Participants’ Handbook. Based on Paulo Freire‘s popular education pedagogy, Popular Education-Style Image Analysis invites the student to reflect on self and society in a way that can lead to a critical consciousness and action. Similar yet different from the Historical Image Analysis approach familiar to many historians, the Popular Education-Style Image Analysis can be incorporated into Social Sciences courses as a way to connect theory to action and to develop students’ digital and visual literacy skills. In 1968, Paulo Freire published his now famous book, Pedagogy of the Oppressed. In this text, he lays out a popular education program that was designed to support illiterate poor in developing critical literacy that could transform the world. Popular education developed from his work in Brazil in the 1950s and 1960s. Given that literacy was a requirement for voting in Brazil, teaching illiterate workers how to read had the possibility of significantly shifting political power. Following a military coup in 1964, Freire was jailed for 70 days for his Popular Education work and lived in Chile, USA, and Switzerland for the next decade. Based on Freire’s work, Professor Emerita Deborah Barndt from York University worked in Nicaragua’s Adult/Popular Education program in the 1980s. In 2017, she donated many of her papers to York’s Centre for Research on Latin America and the Caribbean (CERLAC) for digitization. Project member Juan Pablo Pinto Mendoza worked with her on developing an online archive, which her papers and photographs from this time. In the process of working with these materials and learning about Popular Education, Juan Pablo wanted to bring a Popular Education analysis to his exhibit. 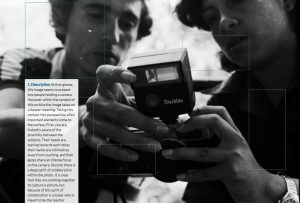 He drew on Dr. Barndt’s experience with Popular Education to developed an image analysis method he applied to multiple photographs. Photograph by Deborah Barndt. Annotation by Juan Pablo Pinto Mendoza. Description: What did you see, hear, or feel in their stories? What do you think is happening? Tell how you feel about it? Personal Association: Have you ever had an experience like that? Can you identify with the problem presented? Social Relationship: How is your experience similar to the experience of others? How is it different? Do you see problems that other people also have? Analysis: Why does this problem exist? What happens because of it? How does it relate to other problems? Action: What resources (person, group, or community) could help solve this problem in the short and/or the long run? Juan Pablo then engaged in the analysis of one photograph from Dr. Barndt’s collection. This style of analysis allowed for a deeper, more personal, and more political exploration of the image and the context of its creation and (re)presentation. In the Assignment Guide for Historical Image Analysis, I identified that you can find image analysis worksheets from several sources. However, “Popular Education” Image Analysis invites the viewer to reflect on self and society in a way that can lead to a critical consciousness and action in ways that standard Historical Image Analysis does not. I also identified in the Assignment Guide for Historical Image Analysis that one of the strengths of engaging in historical photo analysis with a “DHSS” hat on, is that many of the images were not created digitally and thus having the digital historical images available to us on a laptop, on a phone, on a tablet, available to be “remixed” and creatively transformed, to tell new stories about the past, is where the meaning making potential of DHSS is for photo analysis. Juan Pablo’s analysis from a public education point of view, as well as a view from a filmmaker, highlights personal reflection, as well as the development of digital literacy by looking at images’ visual rhetoric. To explore this more, I recommend Purdue Online Writing Lab (OWL)’s Visual Rhetoric PowerPoint video created by Karl Stolley and Allen Brizee (a PPT file will download and open), as well as this Visual Analysis slide deck developed from the composition textbook Frames of Mind. The presentation of Juan Pablo’s Popular Education analysis, like Denise’s “pop-up” historical image analysis, was done through Scalar. To replicate their work, one would have to be familiar with Scalar. However, an alternative to the annotations through Scalar, is to use an easier platform like WordPress or a photosharing site like Flickr. here are surprisingly not as many photo analysis tools for DHSS as one would think. Thus, to show students’ analyses, you can be creative in the tools your students already know, such as PowerPoint or Prezi, as well as integrate their formal analysis into other assignments, such as developing an exhibit, creating metadata, mapping, or proving/disproving an argument. Images can be chosen from archived sources but also collections of unidentified photos that can be found on Instagram, Flickr, and other photosharing sites. In many ways, asking your students to analyze less-common photographs than the ones used in class may elicit more complicated ways into content analysis. Images can be chosen from archived photographs, but engaging in this work with common or familiar media such as advertisements, Instagram posts, or memes may encourage greater critical analysis of the images that make up students’ worlds. Public Education-Style Image Analysis by Samantha Cutrara, PhD, for the Office of the Vice Provost Academic, York University is licensed under a Creative Commons Attribution-NonCommercial-NoDerivatives 4.0 International License, except where otherwise noted.